Argon gas has found another important use as the popularity of Metal Additive Manufacturing, or 3-D metal printing, grows across a variety of industries. The process, which uses lasers to melt ultra-thin layers of atomized metal powder to build a three-dimensional part one layer at a time first gained popularity for rapid prototyping. As the technology has improved, though, it is now being used to manufacture precision parts used in industrial, aerospace, medical and dental, and automotive applications. Because the lasers involved are selectively melting micro-fine material to produce these precision parts, any oxidation or impurities like nitrides introduced into the fabrication environment could easily ruin the run. Argon gas is inert, so it prevents oxidation and is not flammable. Argon is used to reduce oxygen concentration in the manufacturing area to less than 500 PPM (parts per million), which essentially eliminates the possibility of oxidation during the manufacturing process. As Metal Additive Manufacturing has become commercially viable, in terms of both cost and possible output, it opens a vast assortment of potential uses, producing objects which were simply not feasible using previous manufacturing techniques. It is already being used to fabricate parts for planes, spacecraft, and cars, along with custom-made orthopaedic and dental devices. Imagine someone who has suffered massive injury to their facial structure. Until very recently, doctors were limited to using “off the shelf” shapes to rebuild that patient’s face. It is now possible to construct implants designed to imitate that specific patient’s facial structure, and restore them to a much more natural appearance. Imagine precision-made dental implants, partials, or bridges, instead of clunky, molded approximations of imprecise impressions. Imagine doctors being able to custom design replacements for injured joints. These are no longer the stuff of science fiction. One area where Metal Additive Manufacturing is making a big splash is in the production of injection molds. In addition to tighter tolerances, 3-D metal printing allows for more complex and efficient cooling channels to be built into the molds which shortens cooling time, improves cooling performance, and extends the useful life of the mold itself, so there is less waste. Because 3-D metal printing allows for bespoke functional parts to be produced quickly and without the expense of tooling, it lends itself beautifully to research and development of production automotive parts, in addition to specialized parts for racecars. The process is also lending itself to advances in aerospace because, among other benefits, it allows researchers to develop parts that are lighter in weight, often with improved function. And lighter planes consume less fuel, which reduces the environmental impact. Let’s Hear It For The Gas! Thanks to competing systems and falling prices, more shops than ever before will now have access to Metal Additive Manufacturing capabilities. 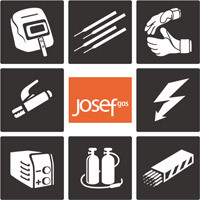 If your shop is setting forth on this new frontier, the experts at Josef Gas are tradesmen with practical experience using industrial gas. We are a Canadian-owned, mid-sized supplier of industrial gases: an independent company with an independent attitude, not a distributor for one of the gas giants. We operate our own fleet of cylinder and bulk gas delivery trucks throughout the Greater Toronto Area. Our 40-year relationships and long-term supply agreements with our gas suppliers, combined with our relatively low overhead, ensure that we are able to offer our customers great prices on all of the gas products we sell. We invite you to request a free quote online, or give us a call at 416-658-1212 to speak to one of our representatives for more information or help with a quote for your argon gas delivery.